Brunch is our most favourite meal of the day. We, as you probably know, run to eat. When we go for our long runs, there's only ever one destination we run towards: our favourite food spot. The perfect reward for a morning of hard ground pounding and sweating! One of the great things about running in London is discovery, whether it's a new scenic route or a new spot to eat, and I think we might have found our new favourite run to eat destination! Last week, we were invited to Gail's Artisan Bakery to indulge in a tasting session of their new menu, and boy did we eat! With Laura being a true Parisian, and me being a true fatty, there really is nothing better than the simple pleasures of freshly baked bread. Gail's specialises in handmade artisan bread made from the finest ingredients, the thought alone is enough to make anyone's mouth water. As soon as we walked into the bakery the smell of freshly baked goodies hit us. 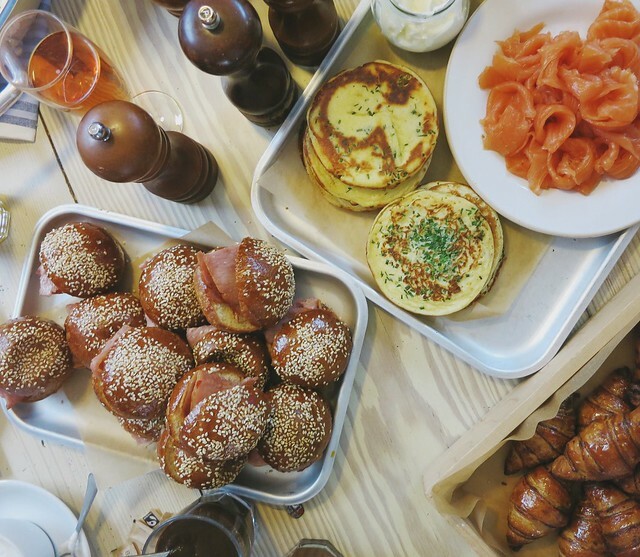 It wasn't long before we spotted the mountain of sliced French Dark Sourdough and Spelt Sourdough bread alongside piles of rugelach (or for your average Londoner - aka me - mini croissants and pain au chocolates) beautifully presented in wooden trays. Talk about Instagram worthy! We kicked off our brunch lightly with a fruit salad and a perfect portion of freshly made granola, yogurt and fruit compote. Next up we had the BEST savoury muffin we've ever tasted. Made from cornbread and accompanied by avocado salsa and sour cream, the muffin was moist, airy and full of flavour - a balance which is quite hard to achieve according to Laura's expertise! By this point, we were pretty stuffed to the brim but the food kept on coming. Mini bacon butties did the rounds soon after, these were far from your average - rashers of free range back bacon stuffed in soft and glazed cream buns! GET IN MY MOUTH. 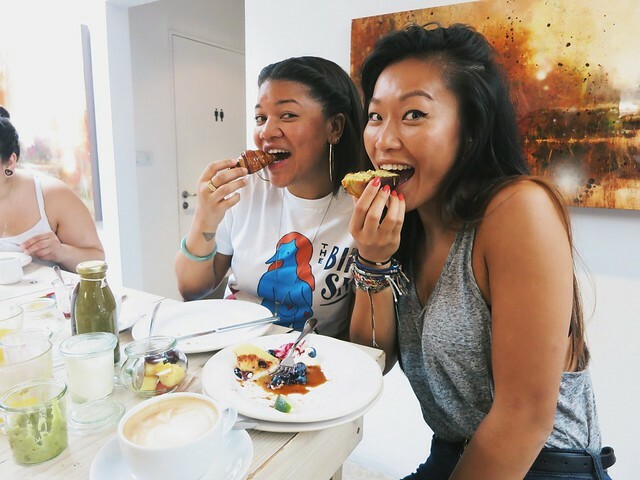 We sampled their pancakes too, they looked too good to pass over - we were literally eating half a mini pancake each just so we could taste everything. 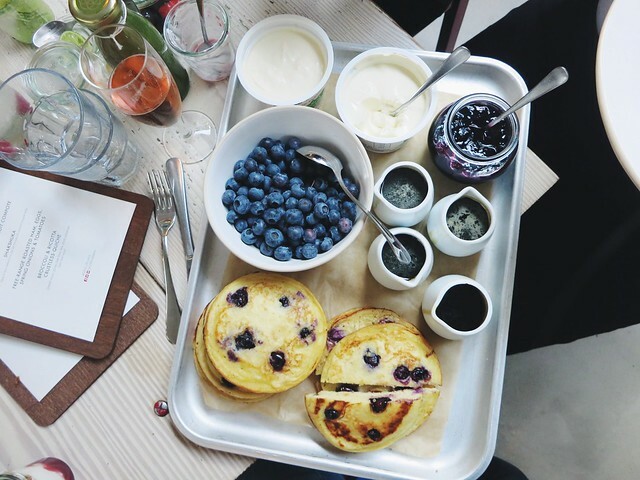 Savoury chive buttermilk pancakes with smoked salmon to start, and your staple blueberry pancakes for a sweet finish! The last thing on the menu for us to sample was the shakshuka - a arabic version of baked eggs. The blend of eggs and feta cheese in a smoked tomato and pepper stew smelt amazing, and was insanely rich and tasty. The peppery tomato flavours really stood out, and you could barely taste the feta cheese. This dish is definitely a stand alone dish, if you're going to order it, don't bother with anything else as it's quite heavy. It'll go nicely with a couple of slices of Gail's sourdough bread, and is perfect for the coming winter months. Perfect, post run comfort food! We can't stop raving about how great the food was at Gail's, and to think we only had a sample of what they have to offer! Can't believe it was the first time we ate there too. Next on the list for us to try are their cakes, we saw some madeleines come out the oven and it looked amazziinngggg! Each madeleine was delicately hand shaped by the baker! 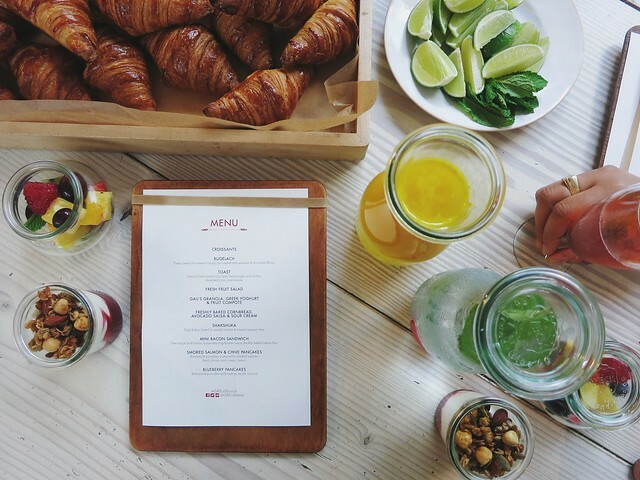 They forgot to mention 'bring your elasticated trousers' on the invite to this sample brunch, but on our We Run to Eat escapade we'll be grateful for our stretchy waistbands on our lycra leggings! Let us know what you think about Gail's on your next visit!